Note: For a better experience, use the Zoom Scheduler add-in for Office 365 (desktop or mobile). The Zoom Microsoft Outlook Plugin is designed to make scheduling a meeting in Microsoft Outlook quick and convenient. The plugin allows you to schedule and start instant Zoom meetings, as well as make existing meeting events Zoom meetings. The Outlook Plugin can also sync free/busy times to the Zoom Client based on your Outlook Calendar events (PC only, requires version 3.5 or higher - download the latest version). Note: Due to new security protocol, the Outlook Plugin is only supported on Mac OS 10.14.1 and above. If you are running an older version, we recommend updating Mac OS, using the Office 365 Add-In (Web And Desktop), or disabling System Integrity Protection (SIP) on the operating system. You can download the Zoom Microsoft Outlook Plugin MSI file from the Download Center. Once the download is complete, run the MSI file and follow the install wizard to complete the installation. You will need to restart Outlook before using the Plugin. Note: Several versions of Outlook do not support the options to Schedule a Meeting or Start Instant Meeting. If you do not see these in the main ribbon bar, please check to see if they appear after creating a new appointment or calendar event. Select your desired settings for scheduling a meeting. Video - Host: If you select on, the host's video will be automatically started when starting the meeting. If you choose off, the host's video will be off, but they will be able to turn it on. Video - Participant: If you select on, the participant's video will be automatically started when joining the meeting. If you choose off, the participant's video will be off, but they will have the option to turn it on. Audio Options: Choose whether to allow users to join using Telephone only, Computer Audio only, Telephone and Computer Audio, or 3rd Party Audio (if enabled for your account). Require meeting password: Enter a password if you want to require participants to enter it to join the meeting. Enable join before host: Allow participants to join the meeting without you or before you join. Recording the meeting automatically: Check this if you want the meeting to be automatically recorded. Select if you want it to be recorded locally (to your computer) or to the cloud. Learn more about automatic recording. Force include Join URL in location field: This will include the join URL in the location field even if you attempt to remove it. Alternative hosts: Enter the email address of another Zoom user with a Pro license on your account to allow them to start the meeting in your absence. Save and do not show again: Check this if you would like to use these same settings as a default for other meetings going forward. The settings window will not pop up and you will need to manually open it to edit the settings. The calendar invitation will automatically generate with the Zoom meeting information. 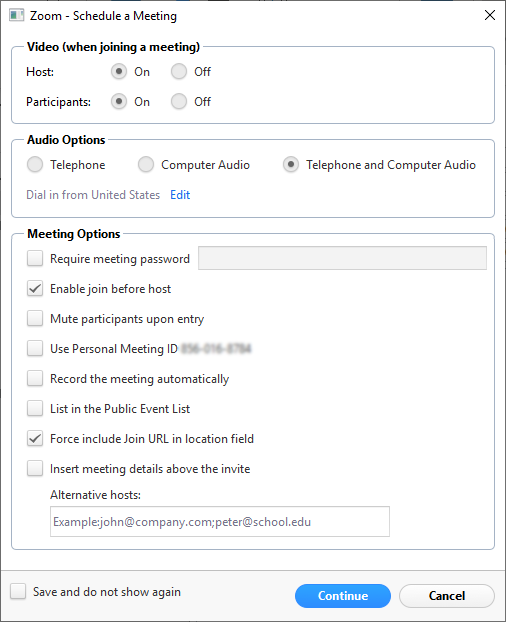 Note: You can cancel the Zoom meeting or change the settings of the Zoom meeting in the calendar invitation by selecting the corresponding buttons in the menu. Click on the arrow at the bottom of Schedule a Meeting. If you have multiple PAC accounts, choose which you would like to schedule with. Open an existing calendar event in Outlook. Select your desired settings for scheduling a meeting. See the Scheduling a Meeting section for more details. The invitation will now automatically fill in with the details. 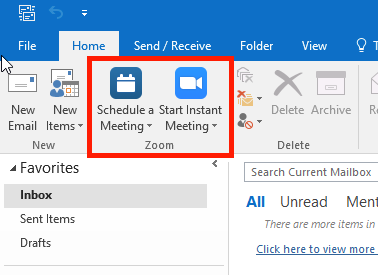 If you do not see the Schedule a meeting icon in the menu ribbon, open your Outlook options. Check the Zoom Outlook plugin box. How do I use the Microsoft Outlook Plugin? Where do I download the Microsoft Outlook Plugin? Can I schedule meetings in Outlook?